Here is this week’s list of comic strips, legends, poems, and other links from my favourite corners of the web. It’s another one of those big lists where I couldn’t bear to trim anything out because everything was so good. The picture on the left isn’t actually related to any of the links this week. 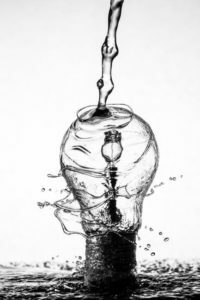 I broke that rule this time because I was so fascinated by the idea of pouring water on a lightbulb. It seem like something a small child would do once, get in big trouble for it, and then maybe joke about it 20 years later. Spring is a State of Mind. One of the reasons why I love this time of year so much is that we go from about 9 hours of sunlight a day in the winter – most of which are usually covered up by a thick layer of clouds – to more than 15 by the end of June. All of that extra light makes me ridiculously happy. The Rise of Grok (or How I Learned to Embrace My Ignorance) via JamesTheo. Why is it so hard for people – including myself – to admit when we don’t know something? This post explores that issue in depth. How to Cure a Werewolf. Who else loves creative stuff like this? I’d never heard of this twist to werewolf mythology before. When Your Child Is a Psychopath. The headline is a little sensationalistic, but the article itself is excellent. Yesterday via ‪CarlBusbySr‬. On the dangers of too much nostalgia. My Grandmother’s Desperate Choice. I wonder how many other people have stories like this hidden in their family trees? How to Find the Original Source of Online Images. All of the pictures I feature on my site are either in the public domain, don’t require citations, or include links back to the original site if that’s what the owner wants. This is how you figure out where that cool picture originally came from so you can properly cite the images you want to share as well. The Bipolar Friendship Manifesto via ‪GumOnMyShoeBook‬. This was interesting. evening light plays on my roses.